Cottontail rabbits are a frequent garden pest in North America. Rabbits are herbivores that eat mainly grasses, but they also enjoy sprouts, leaves, fruits, small grains and the twigs, bark and buds of shrubs and trees. There are various methods for keeping rabbits out of your garden while still appreciating them as part of the natural landscape. Cottontail rabbits can raise as many as six litters per year, averaging five young per litter. If you haven't observed rabbits feeding in your garden, you may be able to identify them by the damage they cause. 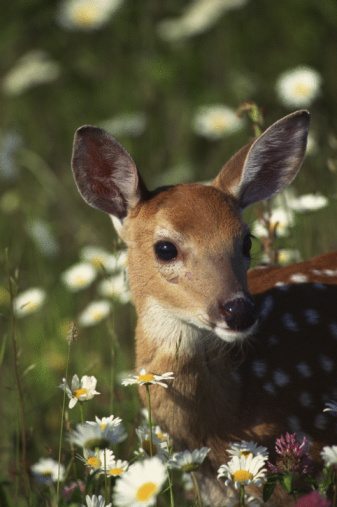 Rabbits clip plant twigs off at a 45-degree angle versus the jagged edges made by other mammals such as deer. Rabbits eat mainly grasses but they will eat a variety of foods. They are attracted to home gardens that grow certain preferred vegetables and flowers that add nutrients to their diet. In the winter, when green plants are less available, they gnaw on woody plants for food. They prefer smooth-barked trees to rough. The gnawing damage can occur up to 2.5 feet above the ground or above the level of snow cover. Rabbits' winter feeding may result in young plants that are clipped off at snow height or trees that have been killed by girdling, the removal of a complete strip of bark from around the trunk. Distinctive round pellets and track marks at the feeding site are other clues that rabbits are the problem. Rabbits favor areas that provide food and cover such as brush, wood piles and field and forest edges. They do not favor grassy open areas or dense forests. Removing piles of stone, brush, wood and other debris from your landscape will discourage rabbit activity. You can also remove cover by keeping grass and weeds mowed and cutting down brush thickets. Prevent rabbits from hiding underneath sheds and other structures on raised platforms by placing a wire mesh barrier around the platform. Fences are an effective means of deterring rabbits. Rabbit fences do not have to be tall or especially sturdy. A fence of 2- to 3-foot high chicken wire -- 1 inch or less mesh -- or other wire fencing material with the bottom tight to the ground or buried a few inches is enough to keep rabbits out of your garden. Chicken wire is flexible and easily cut with wire cutters. Fasten the chicken wire to wooden stakes with a staple gun or use metal stakes with hooks for fastening. Make sure the wire is taut between stakes. U-shaped anchor pins can be purchased to help secure the fence to the soil. As a further deterrent to burrowing under the fence, bend the bottom edge of the fence outward in an L-shape before burying. 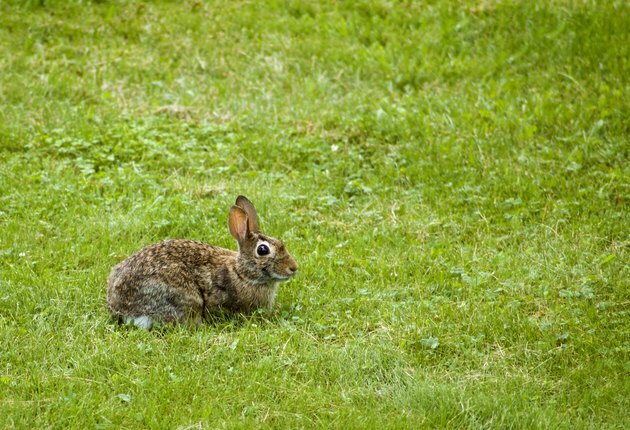 Repellents discourage rabbits from browsing in your garden. Many commercial as well as homemade repellents are unpleasant to the rabbit's sense of taste or smell. Commercial sprays are available that use the capsaicin in hot peppers as a taste repellent. Putrescent egg solids are an effective odor repellent used in commercial sprays. If you know rabbits are a problem in your area, you can use repellents before rabbit damage occurs. Otherwise, apply the repellents at the first sign of rabbit damage. Repellents must be reapplied frequently, especially after rainfall. Use caution when choosing repellents -- a few products should not be applied directly to consumable plants. Read and follow all label directions carefully. Rabbits eat a wide variety of vegetables and flowers. They will seek out favorite foods such as peas (Pisum sativum), beans (Phaseolus vulgaris), carrots (Daucus carota var, sativa), beets (Beta vulgaris) and tulips (Tulipa spp., U.S Department of Agriculture plant hardiness zones 4 to 10). Vegetables that are rabbit-resistant include cucumbers (Cucumis sativus), squash (Cucurbita spp. ), potatoes (Solanum tuberosum), tomatoes (Solanum lycopersicum), corn (Zea mays) and some types of peppers (Capsicum spp.). Daffodils (Narcissus spp., USDA zones 4 to 9) can be planted instead of tulips, as they are much less susceptible to rabbit damage. Beyond rabbit-resistant plants, rabbit-deterring plants repel rabbits. These plants may have toxic properties or other undesirable characteristics that keep rabbits away from the garden. Annuals: Impatiens (Impatiens spp.) come in a variety of colors and make attractive border plants. Ageratum (Ageratum houstonianum) grows in mounds and flowers nearly all summer. Plant these annuals around the edges of your vegetable garden to help deter rabbits. Perennials: Coneflower (Echinacea purpurea, USDA zones 3 to 8) blooms all summer long. Daylilly (_Hemerocallis fulva, USDA zones 3 to 10) spreads rapidly and comes in many hybrid varieties. Beebalm (_Monarda didyma*, USDA zones 4 to 8) also spreads rapidly and attracts butterflies. These perennials work well in naturalistic gardens, in mixed perennial borders and along fences of vegetable gardens to deter rabbits. Groundcovers: Periwinkles (Vinca major, USDA zones 7 to 9; Vinca minor, USDA zones 4 to 9) and English Ivy (Hedera helix, USDA Zones 5 to 9) grow well in shady conditions under trees. Rabbits prefer plants of the rose family such as apple trees (Malus domestica, USDA zones 3 to 8) and raspberries (Rubus spp., USDA zones 3 to 7), so planting rabbit-deterring groundcovers around preferred trees and shrubs can help protect them. What Kinds of Flowers Do Voles Hate?